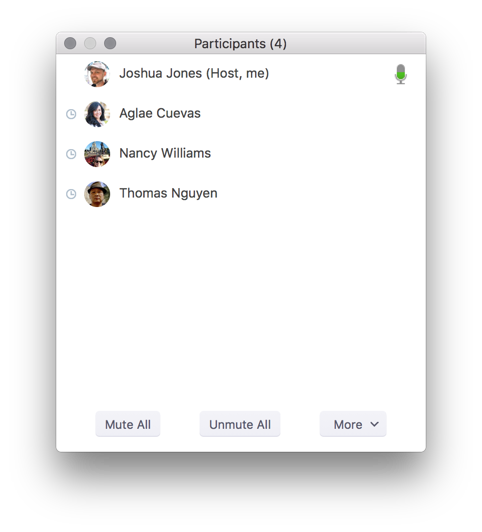 Hosts can see an indicator in the Participant panel of a meeting or webinar if an attendee does not have Zoom in focus for more than 30 seconds. Note that this indicator never displays for participants using an older version (prior to 4.0) of the Zoom client or mobile app. Navigate to the Attention tracking option on the Meeting tab and verify that the setting is enabled. To use attention tracking in your meetings or webinars, begin your meeting or webinar, and click the Manage Participants icon. An indicator displays in the Participant panel next to the name of any participant who does not have Zoom in focus for more than 30 seconds. Note that this indicator never displays for participants using an older version (prior to 4.0) of the Zoom client or mobile app.